For the book by Tom DeLay and Stephen Mansfield, see No Retreat, No Surrender: One American's Fight. 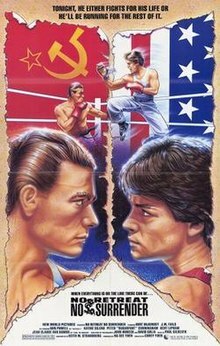 No Retreat, No Surrender is a 1986 American martial arts film directed by Corey Yuen in his American directorial debut, and starring Kurt McKinney and Jean-Claude Van Damme. The film was released in the United States on May 2, 1986. McKinney performs as Jason Stillwell, an American teenager who learns karate from the spirit of Bruce Lee. Stillwell uses these lessons to defend his martial arts dojo against Soviet martial artist Ivan Kraschinsky (Van Damme). The film was written by Keith W. Strandberg after being contracted by Ng See-yuen, the owner of Seasonal Film Corporation, to write a script for them, despite having never written a script beforehand. Van Damme was cast in the film and caused problems on the set for continually physically contacting other actors and stuntmen during the fight scenes even after director Yuen told him not to. Upon release, the film received negative reviews, focusing on the story which some reviewers found too similar to the 1984 film The Karate Kid. Retrospectively, the film has received praise for its well-choreographed fight scenes featuring Van Damme. Jason Stillwell is a young karate student and Bruce Lee fanatic who trains in his father Tom's dojo in Sherman Oaks, California. One night after a training session, the dojo is visited by members of an organized crime syndicate looking to take over all the dojos in the country. After refusing to join the organization, Tom's leg is broken by a Soviet martial artist named Ivan Kraschinsky, one of the boss' hired thugs. The Stillwell family relocates to Seattle, where Jason meets R.J. Madison and they become good friends. Jason reunites with his old girlfriend Kelly Reilly, who lives in the neighborhood with her brother, local black belt Ian. Despite this, Jason has a hard time adjusting, as he and R. J. are constantly beaten and harassed by the local bullies led by an obese boy named Scott and arrogant martial artist Dean Ramsay. After getting beaten up and humiliated by Scott and Dean at Kelly's birthday party, Jason visits the grave of Bruce Lee and beseeches him for aid. Later that night, Jason and Tom have a heated argument over Jason's involving himself in fights. When Jason calls his father a coward for running away from the syndicate, Tom destroys some of Jason's Bruce Lee memorabilia in the garage. Distraught, Jason consults with R.J., who suggests that Jason move all of his training gear into an abandoned house nearby. Exhausted from the move, Jason falls asleep at the house, but is suddenly awakened by the soul of Bruce Lee, who appears to Jason and begins to train him. Under Lee's tutelage, Jason goes from a below average fighter to a superior martial artist, at one point able to fend off several thugs who are assaulting his father in a parking lot. Later on, Jason, Tom, and R.J. attend an annual full-contact kickboxing tournament featuring teams from Seattle and New York. Before the contest can get under way, however, the crime syndicate interrupts and makes a wager that none of the Seattle fighters can defeat Ivan. While Dean and Frank are easily dispatched by the Soviet, Ivan's last opponent, Ian, makes an impressive showing, forcing Ivan to resort to dirty tactics to defeat him. With Ian helplessly entangled in the ring ropes, Scott attempts to bite Ivan in the leg, but the Soviet dispatches him with a headbutt. Kelly tries to stop Ivan by hitting him with a stool, but the Soviet easily disarms her and grabs her by the hair. Spurred into action, Jason charges to the ring and attacks Ivan, much to the delight of the crowd. Utilizing his advanced training, Jason is finally able to conquer his nemesis and earn the respect of his peers and the frustrated crime syndicate members leave Seattle. Jean-Claude Van Damme was cast as the Soviet villain Ivan Kraschinsky. After living in Taiwan for a year in the early 1980s, screenwriter Keith W. Strandberg became interested in working in martial arts films as an actor. Strandberg moved back to the United States and became a tour director in China, where he continued to stop by in Hong Kong to make contact with producers and screenwriters. After being turned down by several studios including Shaw Brothers, Strandberg read about Seasonal Film Corporation and got in contact with the studio head Ng See-yuen. Ng expressed an interest in making an American film and asked if Strandberg knew anything about screenplays. Strandberg stated that he had despite never seeing one before. A year later, ng See-yuen contacted Strandberg in America stating that he wanted to write a script for them. Strandberg wrote a draft of what would become No Retreat, No Surrender. While production began on the film, Strandberg was on set and spent hours every night changing the script to improve its quality while filming. 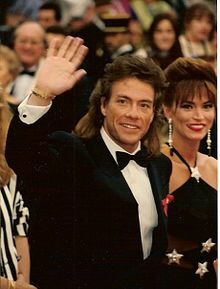 Jean-Claude Van Damme was cast as the Soviet villain Ivan Kraschinsky. On set, Van Damme performed a round house kick on Pete Cunningham which rendered him unconscious. Actor and martial artist Timothy Baker stated that while working with Van Damme during the action scenes on the set, the production manager and director Corey Yuen instructed him to not make contact with the other actors and stuntmen. Despite continuous warnings, Van Damme continued to make contacts with his kicks to Baker on the set. Other actors and martial artists claimed that Van Damme had not been reckless with his physical contact with people during the fight scene including Ron Pohnel who said that "His control wasn't such as mine, but I had no complaints." Van Damme originally had a two picture deal with screenwriter Strandberg but broke his contract. No Retreat, No Surrender was released on May 2, 1986. The film was the eleventh highest grossing film on its opening week in the American box office grossing $739,723. The film grossed a total of $4,662,137. While there was never a DVD release in the United States, a Blu-ray release was announced for the second half of 2016.. Kino Lorber Classics released the Region A Blu-Ray on February 21, 2017, which contained both the American theatrical release and a longer international cut. Walter Goodman of The New York Times gave the film a negative review, writing that the screenplay was "thrown together". Time Out compared the film to The Last Dragon, Karate Kid, and Rocky IV noting that it "borrows heavily" from those films and "makes them look like masterpieces". The martial arts magazine Black Belt gave the film a rating of one and a half out of five noting that Jean-Claude Van Damme does not have much screen time and that the film was derivative of The Karate Kid. Patrick Goldstein of the Los Angeles Times called it "hilariously bad" and an "amateurish clunker" with poor action scenes. In 1993, Black Belt placed the film at seventh on their list of top ten choreographed martial arts films. The magazine specifically praised Van Damme's jump kicks while noting that McKinney's look "suspiciously quick" noting that "unlike the Hong Kong movie industry, American filmmakers have yet to master the technique of speeding up the film without "jumpy/fidgety" side effects". In 2017, Ed Travis of Cinapse said the film "manages to never the less [sic] entertain and delight with a combination of pure earnestness and legitimately cool fight work." Austin Trunick of Under the Radar said Van Damme's scenes "are prime Van Damme, at least, with some fantastic fight choreography and a full showcase of splits, high-kicks, and bug-eyed snarling." ^ a b c d e f g h i j "No Retreat, No Surrender". British Film Institute. London. Retrieved October 10, 2012. ^ "NO RETREAT, NO SURRENDER (15) (CUT)". British Board of Film Classification. July 24, 1986. Retrieved November 26, 2015. ^ "Seasonal Film Co". BFI Film & Television Database. London: British Film Institute. Retrieved February 26, 2013. ^ a b "No Retreat, No Surrender". Box Office Mojo. Internet Movie Database. Retrieved February 26, 2013. ^ "Jean-Claude Van Damme". The A.V. Club. Retrieved March 22, 2011. ^ a b c d e f g Logan, Bey. "The No Retreat Man" (PDF). Keith Strandberg Official Website. Retrieved February 26, 2013. ^ a b Window, Thomas W. (July 1993). "The Trial of Jean-Claude Van Damme". Black Belt. Active Interest Media, Inc. 31 (7): 21. ISSN 0277-3066. Retrieved February 25, 2013. ^ a b Window, Thomas W. (July 1993). "The Trial of Jean-Claude Van Damme". Black Belt. Active Interest Media, Inc. 31 (7): 22. ISSN 0277-3066. Retrieved February 25, 2013. ^ Mannikka, Eleanor (October 10, 2012). "No Retreat, No Surrender". Allmovie. Archived from the original on July 29, 2014. ^ "Chart May 2-4, 1986". Box Office Mojo. Internet Movie Database. Retrieved February 26, 2013. ^ "No Retreat, No Surrender Blu-ray". Blu-ray.com. June 22, 2016. Retrieved October 15, 2016. ^ "Kino Lorber Classics: No Retreat, No Surrender". Retrieved June 28, 2017. ^ Goodman, Walter (May 17, 1986). "No Retreat No Surrender (1986)". The New York Times. Retrieved February 25, 2013. ^ CB. "No Retreat, No Surrender". Time Out. Retrieved February 25, 2013. ^ Clary, David W. (October 1992). "Hot Property". Black Belt. Active Interest Media, Inc. 30 (10): 20. ISSN 0277-3066. Retrieved February 25, 2013. ^ Goldstein, Patrick (May 6, 1986). "Movie Review : No Rhyme, No Reason In 'No Retreat'". Los Angeles Times. Retrieved July 11, 2014. ^ Window, Thomas W. (May 1993). "The 10 Best and 10 Worst Choreographed Martial Art films". Black Belt. Active Interest Media, Inc. 35 (5): 21. ISSN 0277-3066. Retrieved February 25, 2013. ^ Travis, Ed (February 21, 2017). "NO RETREAT, NO SURRENDER: An Endearing THE KARATE KID Clone". Cinapse. ^ Trunick, Austin (February 21, 2017). "No Retreat, No Surrender". Under the Radar. This page was last edited on 15 March 2019, at 14:44 (UTC).